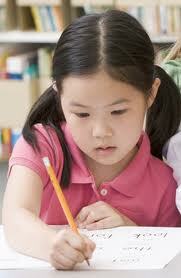 I remember reading a book on teaching children to write in my early years of homeschooling called Anyone Can Write. I have misplaced the book and cannot give the name of the author, but what I remember loving about the book was that it gave specific examples of a progressive approach to teaching our children how to write. As early as kindergarten, the author suggested children help write out grocery lists, to do lists, captions for photographs or descriptions for their artwork. As the children progressed into first and second grade, he encouraged students to expand their writing to include description and explanation. An example of these might be having children write out how to tie a shoe or bake a cake, what they did over the weekend, or a description of all the members of the family. Games with words can aid in building more complex writing skills. Beginning with a basic sentence and seeing how long you can make it by adding adjectives and adverbs is fun. Starting a story and taking turns adding characters and twists in the plot can also make writing enjoyable. 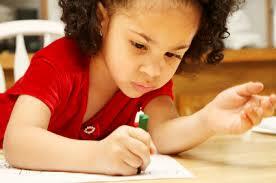 Games are a great way to teach writing without your children realizing they are learning. When the kids had parties in their middle school years, they played a game in which the players all wrote a sentence and handed it to the next person who had to illustrate the sentence. Once was done, the paper was folded so the next person could only see the illustration. That player wrote a sentence caption, folded the paper, and handed it to the next person, who illustrated the new sentence. The game ended when the paper reached the original author of the sentence. The kids laughed so hard looking at how their sentences were transformed and reinterpreted. It was a lesson in communication. The more complex the original sentence, the funnier and more elaborate the results were at the conclusion. Of course for middle schoolers the author of Anyone Can Write taught how to write topic sentences, outlines, essays and research papers. The point I am trying to make is the more your child writes, the easier it is for them to write and the better their writing will become. So, take every opportunity and have your children write. You might just want to write along with them.